Core Lawn Aeration; why do I need it? Core aeration is a type of lawn aeration whereby a machine with hollow tines mechanically removes plugs or “cores” of soil and thatch from a lawn. Core aeration reduces soil compaction, creating a channel through which oxygen, water and nutrients can penetrate into the soil. What is the purpose of core aeration? Healthly soil should be 25% air, but over time, natural compaction will squeeze out the oxygen pockets and suffocates the grass. In Northern Ohio, the freezing and thawing of our winter months further decreases the open space where air can flow. 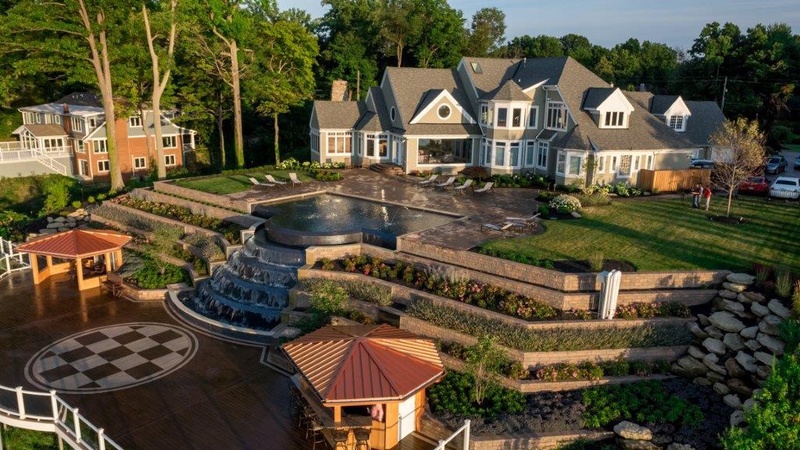 Picture the soil under a healthy lawn. It’s a soil studded with networks of air pockets. Oxygen travels through these pockets, and that’s important: Just because grass roots are underground, that doesn’t mean they don’t have to breathe. It’s more than just oxygen that must percolate down through the ground, but also water and nutrients. Aeration rejuvenates your soil by increasing the natural porous structure that makes grass lush, while also de-thatching. Core aeration removes thatch build-up, which helps relieve the layer of organic matter, intermingled with the soils surface. Many people complain of having moss growing in their lawns, and they attempt to correct this by using the proper herbicide. This is misguided. Lawns that drain poorly due to compacted soil and/or thatch are an open invitation for moss. Areas that get a lot of foot traffic, such as near patios, tend to be more compacted. What is thatch and why don’t I want it? The primary component of thatch is turf grass roots and stems. These plant parts accumulate faster than they breakdown. Thatch is not generally caused by clippings as these are usually high in water content and break down rapidly. This is assuming the lawn is being mowed on a regular basis. When the thatch layer is over ½ inch thick it creates an environment favorable for pests and disease, and an unfavorable growing environment for grass roots. 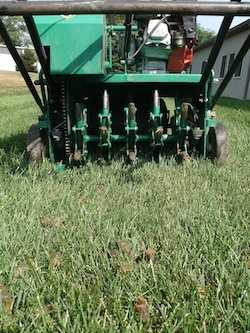 Aeration removes thousands of small cores of soil 1-3” in length from your lawn. These cores “melt” back into your lawn after a few rainfalls or mows. The holes created by aeration catch fertilizer and water. Turf roots naturally grow towards these growth pockets and thicken in the process. Aeration holes also relieve pressure from compacted soils, letting oxygen and water move more freely into the root zone. When is the best time for core aeration? Core aerations are best performed in the spring or fall. Doing a core aeration during the heat of the season will cause unnecessary stress to the turf.